The two Blackbird models: The XLC—with the removable bug net—on the left, and the standard model on the right. Warbonnet updated its flagship hammock, the Blackbird, this year and added a new model, the Blackbird XLC, but let’s cut to the chase—we all want to know what’s actually different. The biggest change to the Blackbird and Blackbird XLC is an overhaul to the bug netting. There is a more 3D shape to the netting where individual pieces have been cut and sewn together, forming angles and “walls” the conform better to the way a person lays in the hammock, providing shape and volume to the interior space. Both Blackbird models have the familiar side pull-outs that help spread apart the hammock fabric and help form The Shelf. 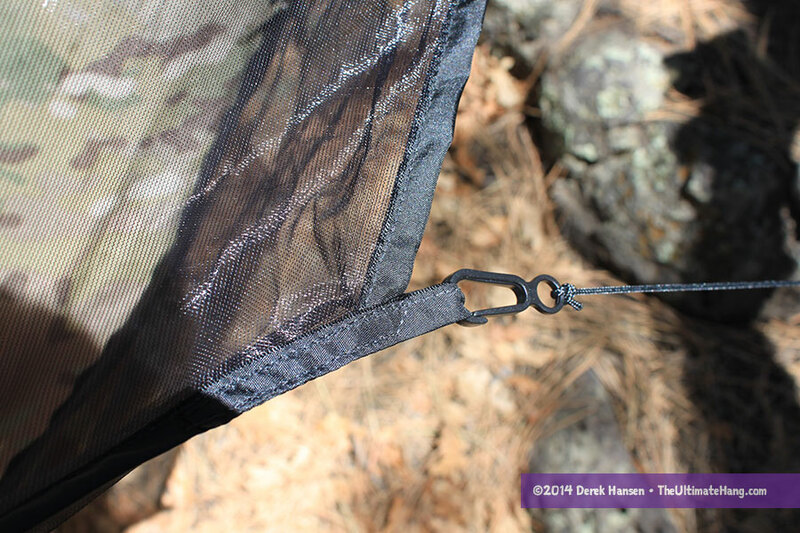 This is a nice feature because you don’t have to worry about leg entanglements when getting in or out of the hammock. Once you unzip the hammock, the bug netting remains pulled out above your head, which is actually very convenient. The side pull-outs on the XLC have mitten hooks to make it easy to disconnect the guyline. This guyline can be attached to over covers or removed completely. The standard Blackbird’s tie-outs are tied directly to the bug netting and are not designed to be removed. The Blackbird XLC model has removable netting. Full perimeter zippers allow you to completely detach the netting when not needed or wanted. This also opens the possibility for zip-on winter shells or covers either by Warbonnet or third party vendors. The Blackbird XLC is about 12 in (30 cm) longer than the regular Blackbird with a ridge line of 111 in (282 cm). Tall hangers will rejoice: the XLC is rated for a user up to 7 ft (2.1 m). When Brandon first released the Blackbird, all the talk was about the footbox. But what is a footbox? When I had my first lay in a Blackbird, I was half expecting some sort of pocket or extension sewn into the hammock that would eliminate the common calf and ankle strain. In truth, the footbox is nothing more than a triangle-shaped piece of fabric that seals off the foot end of the hammock. Think of it as a stopper or end plug that prevents your feet, sleeping bag, pad, or gear from slipping off the edge of the hammock when you sleep diagonally. This allows you to sleep at a more obtuse diagonal angle without falling out of the hammock. All hammocks that have integrated (sewn-in) bug netting have this feature, although the triangle shape further refines the geometry of the hammock to create a natural resting spot for your feet. 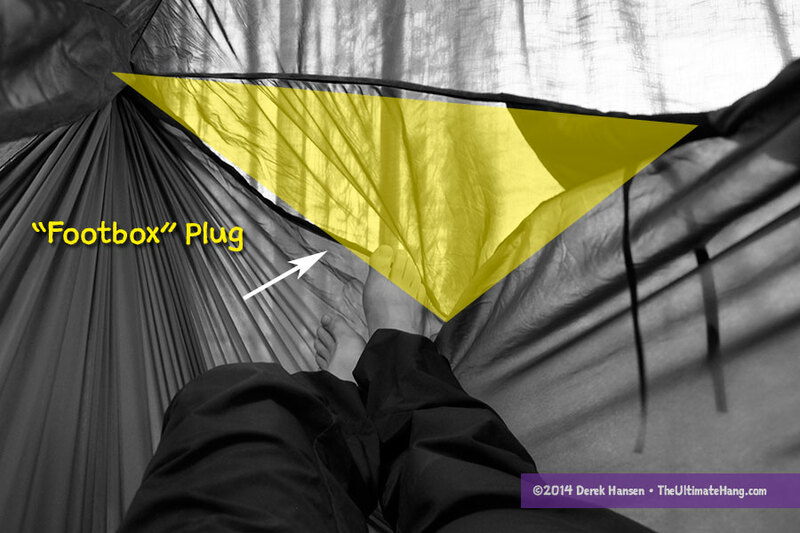 The fixed ridge line and size of the hammock also play integral parts in how the “footbox” works. Everything is designed to position your body in the right diagonal lay. It takes out the mystery of where to lay and helps you find the “sweet spot” quicker. The 2014 Blackbird models replace the fabric plug with mosquito netting. This helps lighten the hammock slightly while maintaining the same function. The netting also provides a little more breathability in the foot area, reducing condensation issues under certain conditions. On the XLC model, the footbox gets zipped off when the bug net is removed. A view of the shelf from underneath. This extra piece of fabric hangs outside the hammock and doesn’t interfere with the lay. A more unique feature to the Blackbird is The Shelf: a fabric extension sewn on the long, right edge that is pulled out to provide a storage space for gear. In the new models, the tie-outs have been improved and the space slightly enlarged. The shelf is one of the most distinguished features of the Blackbird line. It’s a great place to store small items. On the XLC model, the shelf disappears when the bug net is removed, so you lose the extra storage space in net-less mode. Mini split-ring sliders on the side pull-outs—These allow the shock cord to slide back and forth easily when setting up the pull-outs. Double-sided stuff sacks—I’m a fan of double-sided stuff sacks. They just make sense with hammocks and make packing and pitching easier. Ribbon ties to hold open the bug net when partially unzipped (on both the regular and XLC models). Toggles on the XLC model to hold the bug netting secure—This is just a nice touch. 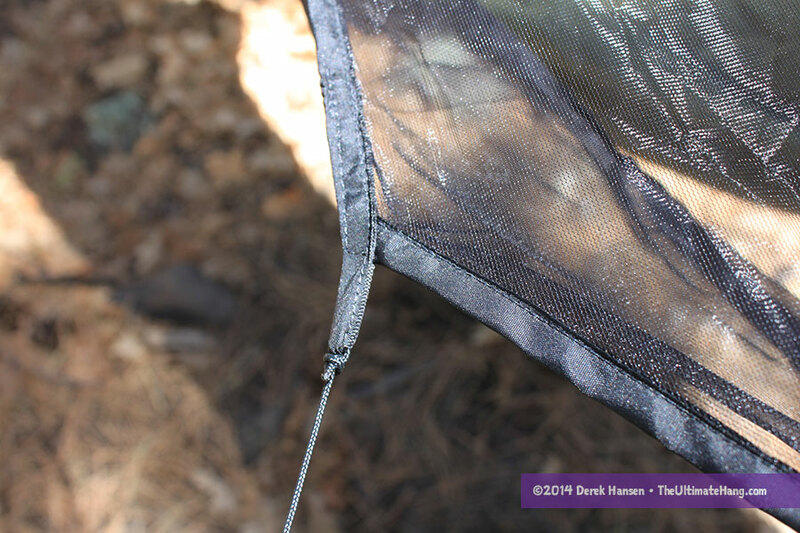 The toggles are attached to the hammock and provide a second method of securing the netting to prevent damage. Plastic o-rings used to prevent the Whoopie Slings from being pulled through—It looks like Brandon clipped the o-ring off of some mitten hooks to make this work. It is a simple, light, and resourceful solution. Shock cord on the side pull-outs for stress relief—The elastic prevents you from damaging the hammock as you move about in the hammock. I have two misgivings about the Blackbird XLC: first is that the zipper has only one pull. This is due to the way the zipper is installed so it can be removed. With only one zipper pull, there is only one way and direction (pull from foot to head) to close up the bug net, so there is a little more reaching involved than with the original Blackbird model. The second issue is how the zipper makes a 180-degree turn at both ends. This sharp turn makes it difficult to pull the zipper around those corners when removing or attaching the bug net. Both Blackbird models have great lays, thanks to the 10+ ft length and adequate sag. 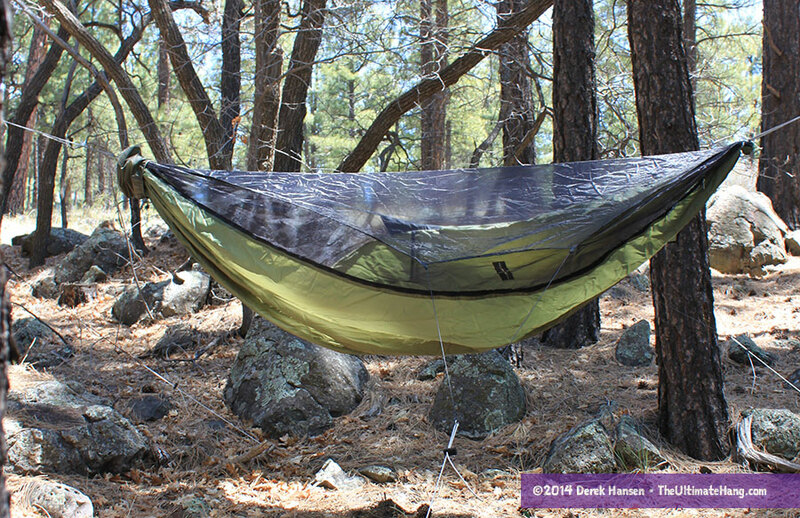 Folks have long praised Warbonnet as one of the more comfortable jungle hammocks on the market. The wide body, fixed ridge line, and diagonal lay helps reduce the center ridge that causes issues such as leg hyperextension and ankle strain. Warbonnet sells multiple versions of each model, differentiated by fabric weight (1.1 vs 1.7 oz), double or single bed layer, and suspension options. The XLC model also offers accessories such as the winter cover. I just made 2 diy WBBB’s and made some enhancements myself. I made the 8″ strip that goes on the “front” 2/3 noseeum so my view isn’t abstructed (though in one of the pictures it looks like that may be the case the WBBB too (can you confirm)? I added the lightweight aluminum Dutch quilt hooks to make hanging my UQ a breeze. I found that with my UQ attached and my backpack hanging from a Dutch gear hook, that I preferred to be able to adjust my ridgeline. So I made a really long Whoopie sling out of Dynaglide and marked inch increments from 95 to 115, so when I dialed in the perfect setting loaded, I could quickly reproduce it. Before I did any assembly of the cut pieces I did double folded hems around all edges for strength. What I discovered is I can forego the grosgrain in most locations now it I provides a great look. I also am in the middle of making a noseeum portal out the “back” under the shelf so I can see behind me (this will have a similar size hammock material that can be velcro’ed on/off, this location doesn’t seem to have the same stresses as the rest of the hammock body, so I feel a 12″ portal or so should be safe). I agree with everything you say about the WBBB design though, absolutely brilliant design by Brandon. I’m sure WB will continue to tweak the design of this great hammock. Great comments. I like roll hems myself for DIY projects. Great review. I took my new XLC out for the first time a few weeks ago and loved it. Your two dings on the zippers were spot on; I had the exact same thoughts after spending a few nights with it. But by far the best hammock in my stable! I’m completly new to the world of hammocks. In the process of building a rustic camp to get teens in the woods. I’d like to build small shelters large enough to accommodate with 6 hammocks.. Any help with dimensions and suggestions on durable hammocks would be greatly appreciated! Will this be an open-air structure or a closed cabin? If the beams are open, you can easily tie straps to connect hammocks to beams. At a camp in the Uinta Mountains, we spent the night in yurts and I hung my hammock between the beams and it worked great. If you build a cabin like a pagoda with a hexagonal shape and have a central beam, you can fan out the hammocks from a central point. Any sort of structure would work, you just need to make sure the structural beams are at least 10 feet to 12 feet apart (3 to 4 meters). As for hammocks and youth, I would pick up parachute nylon hammocks from one of the vendors such as ENO, Grand Trunk Goods, Hammock Bliss, Ticket to the Moon, Trek Light, Kammok, and a few others. They are very durable, easily washed and air dried, and will take a beating. Yep… Pretty accurate. I have the updated WBBB as well. Uber comfy. I’m brand new to hanging. In fact, I’ve never slept in a hammock and am researching making the change over from backpacking tents. I have ordered your book, been watching shugemory’s vids on youtube, and doing other web-based research. I love your review. It’s particularly pertinent because I’m trying to decide between the WBBB and the XLC. I’m trying to use my crystal ball to anticipate complications. As a shorter than average person, at 5’5, I was wondering if the XLC would be too big? I like the removable screen/winter cover option. Do you think using the XLC could lead to calf pressure, leg hyperextension, or ankle strain because I’d be lying more on the hammock ridge than a taller hanger? Any other concerns come to mind? I think you’ll be very comfortable and happy with the XLC model. You are a perfect height for this hammock and I don’t foresee any issues with leg hyperextension. You should be able to get quite flat in the hammock. When I sleep on the ground (or in a bed), I toss and turn a lot, often sleeping on my stomach or side. In a hammock, I nearly always sleep on my back the entire night. Let me know what you decide and how it turns out! Thanks! I will let you know. On that advice I’m definitely leaning towards XLC since I do enjoy winter backpacking. Another question, but first a bit more background. I’m used to the Big Agnes sleeping bag system when on the ground. Not sure if you’re familiar, but the way it works is that the sleeping bags have no insulation on the bottom. Instead, there’s a giant pocket into which the 2″ sleeping pad slides. When on the ground, it makes the bag stay in place if you toss and turn as well as provide insulation. So, I’m trying to decide whether to get the double layer XLC and slide my pad in between as suggested on WB’s website, using the Big Agnes system inside the single layer XLC as I would on the ground with the pad in the bag pocket as usual but a bit less air, or switching to underquilts. My understanding is a lot of heat escapes through air pads because of the open space below the hammock (and lack of a hard surface to keep the heat in). Some people solve this with a closed cell foam pad beneath the air pad. Which I could put between layers of the double layer XLC and then Big Agnes system on top as described above. When people use pads with their hammocks, I often recommend that the slide the pad inside their sleeping bag–kind of a hack way of how Big Agnes does their bags. If you use that bag, you won’t need a double-layer hammock since you can keep the pad secure in the bag. A double layer hammock is helpful in getting in and out, but I think you’ll be fine without a double layer. I think the better reason for a double-layer hammock is for bite protection in really buggy areas. Air pads work by creating a layer of trapped air that can then hold heat. Some pads are better than others in doing this. The NeoAir pads have reflective surface that helps. Some air pads have down inside. I’ve used a Thermarest multiple times in a hammock and have been fine without a second closed-cell foam pad, but when it gets below freezing, multiple pads can boost heat retention. Under quilts are the best solution for warmth-to-weight ratio, superior comfort, and packing. When I first started hammock camping, I kept thinking that there might be places or situations where I’d have to go to the ground, so I stuck with pads and even packed a separate ground cloth just in case. I eventually changed my thinking because I rarely found the opportunity to go the ground and even found myself planning my trips for hammock-friendly spots (e.g., hiking in a mountain and looking for camping spots with trees instead of camping on a bare knoll). Nice review, I Bought my Blackbird XLC DL with whoopies, top cover and Superfly tarp about a month ago, love it.. I used a 6′ piece of REFLECTIX (HVAC insulation) from the hardware store as a pad, and it worked perfectly plus that stuff is super light to carry, much cheaper than the commercial ones. Do underquilts work with the XLC? Do you have any info/reviews on the Clark North American? I’m debating between the Blackbird and the North American. What are your thoughts? The Clark hammocks all have integrated baffles under the hammock, which act like a built-in under quilt without any insulation. In some conditions, the baffles work like a weather shield, preventing wind from robbing heat from under you. Insulation such as extra clothes can be stored in the baffles to create a modular under quilt. It has lots of uses. Of course, a pad or under quilt can be used with the Clark hammocks, so you have lots of options. The other things to consider between hammocks is weight, bulk, and price. The Clark hammocks are generally heavier due to extra material used in the baffles, tent poles, and heavy duty suspension systems. Some of these things can be swapped out or left behind. 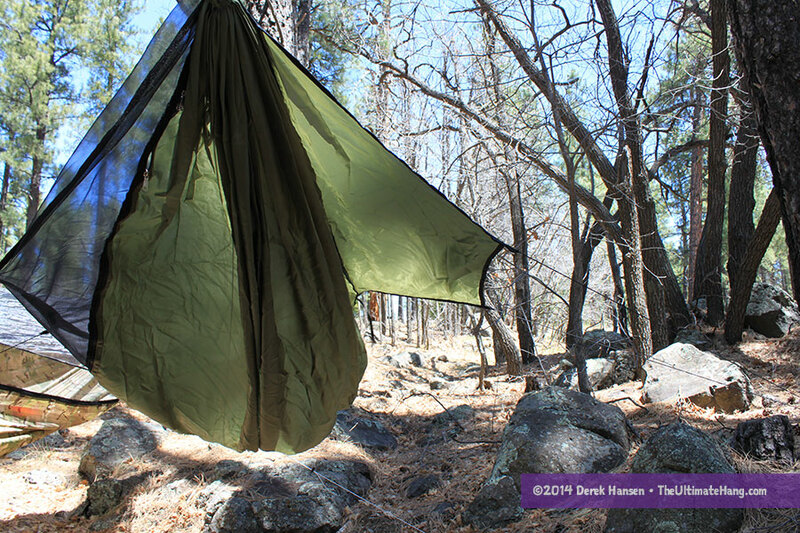 The Clark hammocks also come standard with a tarp, whereas the Warbonnets do not. I don’t think the two hammocks are really comparable in many ways, but hopefully you can research all the objective data for a better comparison as you do your window shopping. To me, weight and bulk are primary concerns since I do a lot of backpacking. But these concerns are not priorities for everyone. Pete, no need to over analyze the set-up. Yes, hanging with one end higher than the other can mess with the hang angle, but it isn’t that important. All you need to do is first hang it level with the right angle on both sides. Next, simply raise the foot end about 12 inches higher. Done! Derek, when you say “simply raise the foot end about 12 inches higher” I am assuming that this is accomplished by tightening the suspension on the foot end correct? No. Typically you set the suspension level, let’s say 5 ft. To raise the foot end, you raise that suspension up the tree a few inches higher than the head end. Hello, I just ordered an XLC for a trip I’m going to make this summer in the south of France and I was wondering if the pad was mandatory to a have a good sleep in summer. Can’t you just sleep in your sleeping bag? BTW I’ll the temperatures there will be between 45 and 65 F at night more often around 50 I’d say. I’ll be using this sleeping bag http://sleepingbags-cumulus.eu/uk/categories/lite-line-300?vid=1 Would you say that’s enough or should I take a small pad anyway? I’d bring a pad. Unless you are using a thick synthetic sleeping bag, you will compress the insulation underneath you, rendering it useless. Only when temps are in the 60s°F am I able to get away with less insulation. Your own body also makes a difference. Hot sleepers can get away with less insulation. Also, in areas where there is only a small difference between day and night temps you can usually get away with less insulation. I might bring a small pad, just in case. A down-filled bag is nice and warm, but it compresses more than synthetic, so you’ll probably feel cool spots. If you can, I would try a backyard test first and see how cold you can take it without a pad. Thanks a lot for your answers. They’re greatly appreciated. As you wisely advised I will test it for a night before I leave. What do you call a small pad? Could you link one? An inexpensive way to get a short pad is to make one. I’d pick up one of those blue closed-cell-foam pads (in the states, Walmart sells them for about US$7) and just cut it in half for a good torso-sided pad. Military surplus stores often sell a similar pad, which can sometimes be found in slightly wider widths. Going up the scale in price, Gossamer Gear sells a few great pads that can also be cut down or folded/modified to your liking. They also sell smaller torso pads. I would test your system first, just like any outdoor adventure. You don’t want to get stuck under equipped. I ended up ordering a topquilt from Warbonnet I’ll use with an inexpensive mat I found http://www.decathlon.co.uk/m100-foam-sleeping-mat-id_5591048.html I’ll get myself an underquilt for fall. Waiting to receive your book to learn more about the hammock way 🙂 Thanks again for answers! Great informative review, many thanks. I’m looking to get into hammock camping in the UK, and thinking of buying my first hammock. I was wondering how, with the new upgrades, you’d rate the Blackbird XLC alongside the UKHammock’s Woodsman X? I’m a 6’1 side-sleeper, but really unsure of the subtle differences of these two hammocks. I’d probably get the Woodsman X. The XLC has a zip-off bug net but that isn’t necessary for some folks unless you want to get the winter cover too. I’m looking to purchase my first hammock. I’m 5’3″ and about 180lbs. I like the convertible feature and the better visibility of the XLC but I’m worried it will be too long for me and that I’ll be lost in a see of fabric! Also, I’m concerned about being able to reach high enough on the tree to set the straps. Any advice for short people? Thanks. You won’t drown. 🙂 longer hammocks are arguably more comfortable. You’ll be fine. Height is relative, and is also based on sit height and distance between the trees. You will be fine. Derek, thanks for the reply. This website is invaluable to a beginner. As are all your follow up responses! I’m purchasing your book on my Kindle now! I’m 6’4″ so I can’t comment on life for the vertically challenged;-) but my sons and wife are closer to 5′. What I’d suggest is finding a stout stick or one of your trekking poles. Set everything up at the height you can reach, then use the pole to push the webbing up the tree. you might try tying a look of parta on the looped end of your tree strap so you can snag it with your pole for pulling it down. Obviously this will be an issue with rough bark trees. I’ve used this method when hanging a 30′ distance between my kids’ playset and a large cotton wood though I used a rock in a sock tied to the tree strap to get it over a limb high enough then tied a rope on so I could loosen and retrieve it later. Used the pole to push it to the height I needed and I was good to go. Hi Derek, Im new to hammocking & have just recieved the XLC 1.1 single double layer & superfly. I come from the land down under, Oz and we have yet to really take off in the world of hammocks. This purchase has caused a stir amongst friends. Im a little concerned as some heavy fiends really want to try it out and I am yet to find out its weight tolerance. Do you know as I cannot find the specs on the warbonnet site? By the way I ordered your book and its been read several times over even before trying out the XLC. LOVE IT! Thanks for an awesome site too and your generous offerings. Thanks Chris! The double-layer XLC is rated to 400 lbs (181 kg). Did you by chance weigh the XLC net? Just curious how much it weighs compared to a full net. Ah! No, I never did, and I’ve given away the XLC too! I’ll have to ask some friends to weight it for me — sorry! Hello Derek! I am looking for the best hammock for urban indoor/outdoor hammocking in downtown Toronto, ON Canada. I would be suspending the hammock from the ceiling/staircase and am looking at the XLC (a) mainly because of the fully removable netting and because I want to fit my husband, me and my 3 + 6 yr old girls in it at times. 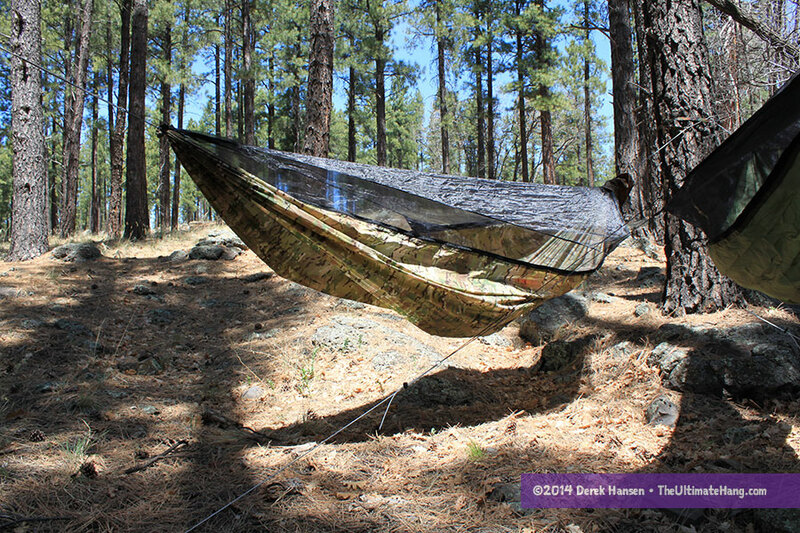 (b) double layer … it gets cold hanging in the double Ticket To the Moon hammock I’m currently testing in my living room (c) versatility to be able to take my hammock outside for real camping, outside on the rooftop deck, down to the park, or indoors in our living room. Can you tell me if I can put an airpad with velcro sides in the double layer? Will the open velcro damage the hammock. The airpad has velcro because it allows for 2x single airpads to velcro together to form a larger double sleeping area. In an earlier thread you alluded to a parachute hammock being possibly more durable. Is this really the case? Can you wash a warbonnet? Which is more comfortable, the Warbonnet or the Ticket To the Moon double parachute? Is the Warbonnet noisy/crinkly? If I try to use the XL Warbonnet without the side ground stakes, will the netting fall/drape all over us … touching our skin? The kids will hate that. Also, the idea of ground stakes around little kids or outside on the deck just sounds difficult/dangerous. Oh, and do you know what the MultiCam XL is? It costs more. Thanks lots for your insights! I’m 6′ exactly and am wondering if the regular BB will be OK for me lengthwise. When it says OK for 6′, does that really mean right up to 6′ or should I get the XLC to be sure? I don’t really need the zip off bug netting in the XLC. I think you’ll be fine. Thanks for the great write up. New to Hammocks and love the idea of the Bug Netting being off of the face. Will have to check out the WarBonnets for sure. There are several models that do this, including Hennessy, Hammeck, Dream Hammock. Thanks – Will check them out. Hi Derek! I found this site as I too am really wanting to go “hang”! I have researched and it seems the Warbonnet XL so far wins. I am just under 6′. I live in far north Indiana ( a mile from the border, so I am thinking the double layer. I am a motorcyclist. Can’t find the pack size but I assume it is small? Any recommendations before I order? I think I’m going to take the plunge and get it ALL at once: XLC, Top cover, under-quilt, carabiners, etc,, What pack size do you think all THAT will have? Seperate rolls? The XLC is a modular hammock designed for all season use. It has a removable winter cover that replaces the bug net. The question I have is whether you will use those features. The only other reason to get the XLC is size: it is designed for tall folks as well. I mention these traits because you may want the Blaxkbird regular. It will save both space and weight. They both pack down to roughly cantaloupe size. The quilts are more variable. Three season quilts will be lighter and pack smaller than cold weather versions, and a 3/4 under quilt will (obviously) pack smaller than a full length one. Each quilt will pack about the length of a bread loaf, with the girth depending on season and fill (down will pack smaller than synthetic). 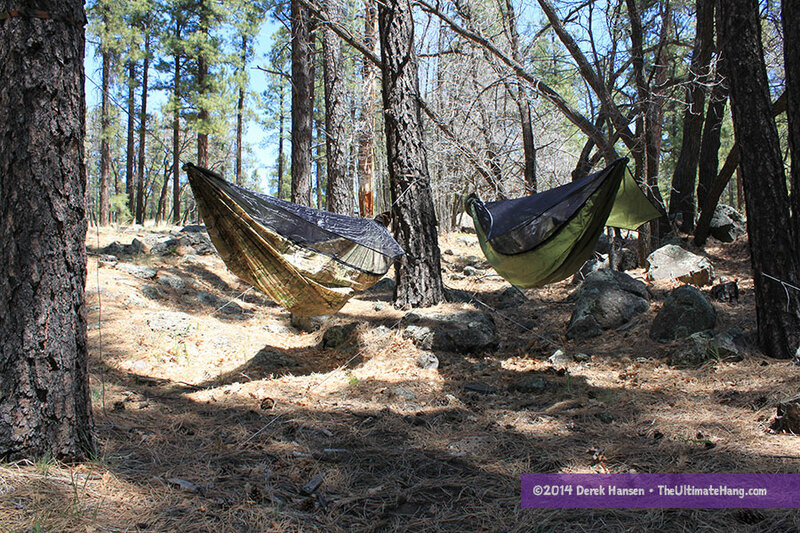 A double layer hammock is most useful if you plan on using a sleeping pad, or if you need the extra weight capacity. In your case I don’t think either really applies. 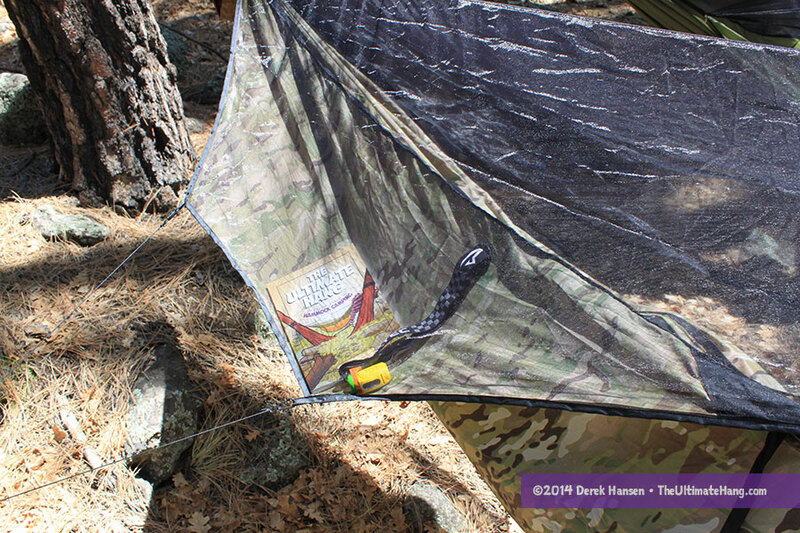 For mosquito bite protection you’ll have the under quilts and if you’re really worried I would treat your hammock with Permethrin, which won’t add any weight and provides more complete protection. I am new to hammocking will be purchasing one fairly soon. The Blackbird XLC seems to be a really great option. I will be using it around my college campus and to camp in. I was wandering though if this could fit two people? I have had a lot of people suggest getting a double sized hammock but I wasn’t sure if this was one. I wouldn’t put two people In any hammock unless you prefer synchronized sleeping. “Double” hammocks ate so named because they are larger than singles but they aren’t large enough that two people can rest comfortably together. Only the largest Mayan hammocks called “matrimonial” hammocks are large enough that two people can lay in their own pockets without disturbing one another. Now, sitting two people in one hammock is possible even with “single” hammocks and the XLC will do fine. Although for me, the XLC is better suited for camping than recreational lounging. If you want a rough and tough hammock for lounging around campus I would get a Grand Trunk double or Hammock Bliss triple as they are larger than an ENO double for the same price. Do you have a USA made or Fair Trade suggestion? Sorry, I should have been more specific. I will also be camping in it equally as much as lounging. The XLC is a good choice, especially if you favor modularity and mosquito protection built in. I just received a blackbird xlc, and wondering if they sent me the wrong hammock. I placed it next to my grand trunk single, and it is only about a half a foot longer than it. Is there any way to tell for sure if they sent the blackbird or the xlc? The XLC has a bug net that can be completely removed. The regular blackbird cannot. Are you measuring the fabric length? great, thanks. Yes, it is the correct hammock (XLC with removable bug net). Just wanted to be sure before using. Very nice build-quality, and great features (I’m already tricking it out with different suspensions and Dutch Apparel, etc…!). I wonder if a seamstress could add a “double” zipper pull, like I have on my ski jackets. So I can open and close zipper in various locations??? PS- Love the book. I have a copy of “The Ultimate Hang” on my tablet. I am looking to become more proficient at hammocking, and that was a great starting point, thanks. * or triple zipper? (is there such a thing?). There has to be a way to ‘remove bug net’ AND have options for moving zipper entry. ? Thanks for a great review on a great hammock. I got mine in 2015. I didn’t see any other difference in the body between the BB and one of my diy hammocks–as you say above, the shape of the bug net “makes” the foot box. The binding on the seam provided body to help define the box even more. I didn’t love the pullouts holding the bug net out on the left side opening. It didn’t hold the hammock body away from my face if I had the net open. Brandon says to throw the left side suspension in the hammock before stuffing it to reduce tangles with the right side suspension. After using for 900 miles, I still can’t remember that. The double ended sack: great, though it was big for just the hammock and not quite big enough for the hammock and a 20 deg underquilt. Also, I’ll replace one whoopie sling with one of a different color so maybe I’ll remember which end was which. No comprendo the short bury section (only 4.25″) of the whoopies. It held me for 45 nights of use last year, but Samson does push for more than that. I can see how the four carabiner setup could be really easy to implement with straps having loops on both ends. But the carabiners aren’t included, nor would buyers need them if each unit came with two 3″ sections of 1/4″ hardwood dowel (1.7 gm each) and instructions/pictures on making a Marlin Spike Hitch. WB has plenty of other videos on site. Overall, a great hammock, that leaves the competition panting. Hey Derek. After doing some research I’m really hesitating on the quilts I should get for my Blackbird XLC. For me it’s a tie between the Enlightened Revolt plus Revelation which seem to be the most versatile solution (I’ll occasionally use my quilt in a tent with my girlfriend) and the Warbonnet Mamba plus the recent Wooki which seem to be totally hassle free and quite efficient. Would you recommend one solution over the other? I haven’t tested the Wooki yet so I don’t have any data to share there. I trust Brandon and it looks amazing. If you want versatility I would go with enlightened. Just position the pad so it is on the inside facing the hammock body not the bug net. Good idea. I think that will work with the top cover. Not sure about the bugnet. I’ll try. Thanks for the thought.